Every year Nic Newman and the team at the Reuters Institute survey news media leaders on what they will be focusing on for the next year. This year’s report is full of valuable insights and is definitely well worth a read. For busy publishers, we have pulled out the top threats and opportunities in the new year. 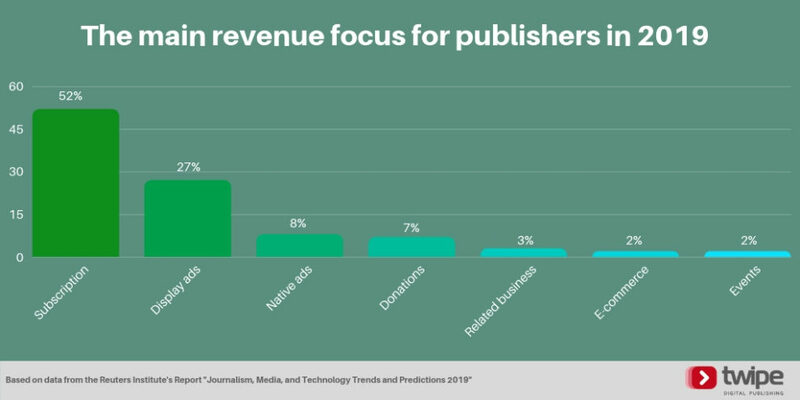 While 2018 may have been the year of the paywall, we expect even more of a priority placed on reader revenue strategies as 52% of news executives believe subscriptions will be their main revenue focus in 2019. Reader revenue strategies will require a re-focus on quality content, measured by time-well spent and engagement, not clicks and overall views. We have already seen how Apple’s ‘time check’ feature has pushed publishers into rethinking their added value for readers, and we expect to see in 2019 more publishers changing how they measure success. It is true that this shift will require new skills and the exact percentage of readers willing to pay for online content is not the same globally, but there are opportunities for publishers of all types to experiment with reader revenue strategies. For example, BoiseDev, a micro-news site in Idaho (USA), created a “time wall” which allows paying members to access content before it is published freely on the web. We are also seeing newsletters make a come back, with more publishers reclaiming them from their marketing teams. Today newsletters are becoming seen for what they really are: a great way to deepen loyalty and prevent churn. This is something we are working on at Twipe as well, with “JAMES, Your Digital Butler” — make sure to subscribe for updates. Reaching younger news audiences, and eventually converting them into paying subscribers, has long been an issue many in the legacy news business have grappled with. We expect to see two main ways publishers will try again this year. The first is via “Stories”, the temporary format first seen on Snapchat and later on Instagram and Facebook. This format is already used daily by hundreds of millions people (150 million on Facebook, 190 million on Snapchat, and 300 million on Instagram) and is expected to surpass feeds as the main way people share news with friends within the year. The second strategy will be audio, with 75% of publishers believing it will become a more important part of both their content and commercial strategies. They may chose to follow the recipe for success The New York Times developed with “The Daily”, which now reaches 5 million listeners — more than they ever reached via print. We know that the elusive under-35 age group is 3-5 times more likely to consume podcasts, when compared with traditional linear radio. We expect to see a continuing trend of re-focusing on the edition format, which allows for a ‘slowing down of the news’. As we see more publishers prioritising their reader revenue strategies, there will be a need to ensure readers find the content worth paying for. Instead of competing on the speed of breaking news, more publishers will take a cue from The Times and The Sunday Times, which moved to an edition-focused strategy in 2016. Instead of chasing the latest news, the team at The Times understand that readers most value their in-depth analysis. In the first year, average pageviews were up 300%, with users of the paid-for mobile app up 30%. We see two news startups following this lead, with Tortoise Media launching soon and the Dutch news outlet De Correspondent expanding in to the US later this year. Tortoise Media will ignore breaking news in favour of going in-depth with 4-5 stories every day, published on its website, app, and via its newsletter. De Correspondent promises to “unbreak the news”, and bills itself as the antidote to the endless scroll of digital platforms and constant stream of notifications. It will be key for publishers to differentiate themselves from competitors in 2019, as we risk reaching max subscription levels. At some point, there will be no new readers to convert into paying for online news and only the pool of existing payers to fight over with competitors. We recently covered this topic in an interview with “The Business of Content” podcast, which is also available as a text transcription. One way publishers may seek to cope with this threat is through more bundling and payment aggregation solutions. We caution publishers considering a digital kiosk solution, as we have seen in Europe that many digital kiosks are struggling to keep publishers on board. But we can indeed expect to see more subscription bundling offers, such as how a six month free trial of The Washington Post comes bundled with Amazon Prime membership, or how The Times of London has added a one-year subscription to the Wall Street Journal as part of their package. Publishers will need to be careful to not recreate the “pivot to video” with the new hype around audio. With growing scepticism of the sustainability about audio, and podcasts specifically, some in the industry fear that we have already hit “peak podcast”. Still, podcasts have not reached saturation levels in parts of non-English speaking Europe, and indeed podcasts are not the only way for publishers to experiment with audio. Smart publishers will continue to experiment with audio in 2019, while keeping in mind the lessons from the hyped pivot to video. Already in Europe we see signs of smart speakers taking off, with the Amazon Alexa app recently topping app stores across Europe on Christmas morning, and with the Amazon Echo Dots being sold out in France, Germany, and Italy until at least March. We can only expect the importance of audio to increase as more and more languages and countries are added. Finally, while publishers will need to refocus on their reader revenue strategies, there is the threat of paywall fatigue for readers which will result in the creation and widespread use of “paywall blockers”. 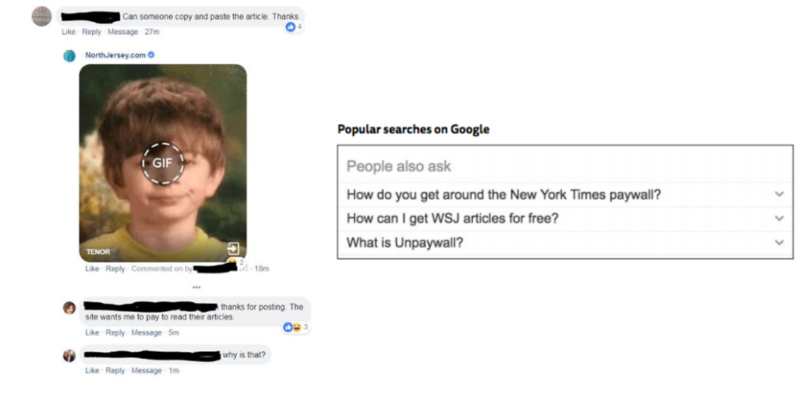 We have already started to see this, with readers sometimes copy and pasting full articles in the comments of social media posts by newspapers, and with the popularity of searches on how to get around paywalls. Never miss a story, subscribe to our weekly newsletter. This entry was posted in Industry news and tagged Digital Strategy, Innovation, Reuters. Bookmark the permalink.